December 29, 2017 – The opening round of the 2018 Monster Energy AMA Supercross Championship is set for Saturday, January 6, 2018 at Angel Stadium in Anaheim, California. 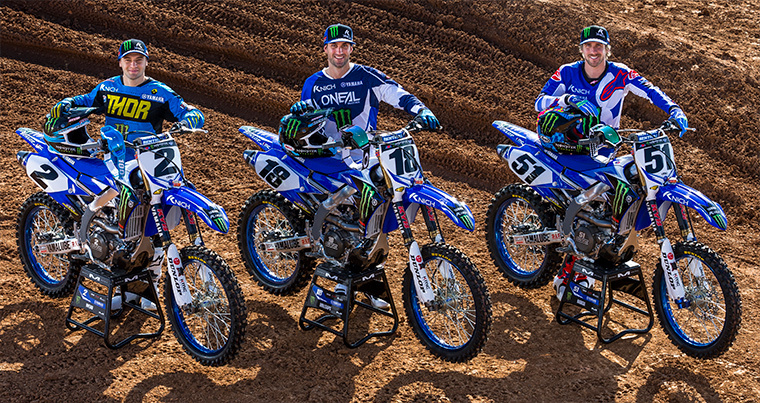 Contesting the premier 450cc class will be the Monster Energy/Knich/Yamaha Factory Racing Team run by Yamaha Motor Corporation, U.S.A (YMUS). The team will field Cooper Webb, who made the step up to the premier class last season after securing the AMA 250SX West and 250MX National titles in 2016, and 2012 and 2013 450SX championship runner-up Davi Millsaps. They will both contest the championship aboard the all-new 2018 YZ450F. Davi Millsaps is currently undergoing rehabilitation for a left elbow injury he suffered in October 2017, so class frontrunner Justin Barcia will stand in for him for the first six rounds of the season as Millsaps allows his injury to heal.